So beautiful Joan... almost look like patterned paper! How do you know where to place the images to have them come out so pleasing to the eye? Thanks for the link to the MISTI. I'm thinking about investing in one. I don't. I have a very hard time making backgrounds. This time I tried to get the different colors in a triangle pattern. Sometimes it works, sometimes it doesn't! Yay! and yes...I totally see Marimekko!! I'm a marimekko fan too -- in fact, I've framed some of their prints! So glad you introduced me to AHA stamps. You have the most amazing way with color! Love this card--the stamping is FABULOUS. Love the graphics of your card. And thanks for the info on the MISTI...it looks very intriguing. I would love to get one. They should give you commission on the MISTI's! Yup, I'll get one eventually. Thanks, Joan. P.S. Love your colorful card - well done. 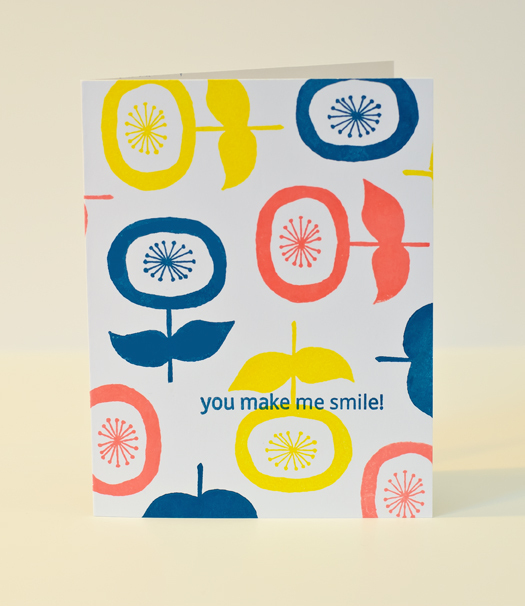 LOVE Marimekko and I love this card, Joan. I need that MISTI thing... Must. Have. It! Love the MISTI and for me it was worth but totally respect and agree that this is NOT a must have. We lived just fine without it. It is a luxury for sure. I have the Fiskers stamp press and in all honesty, I have had problems with some of my cling stamps falling off when I flipped it to stamp (which, resulted in a ruined front, more than once!). I'll be keeping my eye out for further comments on this product!! Hi Joan, Your card is awesome. I went to check out Iliana's website. She's getting many negative and unhappy comments. I felt compelled to reply in her defense. Gee whiz! People get pissed if they don't have instant gratification even in the crafty world. I feel that if I lived and stamped sans a scoreboard for four years, it won't kill me if I wait for this awesome tool. Like you, I struggle with background stamps. I'm certain it will be worth the wait and the expense. Manufacturing in quantity in the USA is a serious JOB! Negative comments because she cannot keep up with demand?? Argh. you just cannot win sometimes! Joan, I love this card! Thanks for linking the Marimekko site - what great inspiration! What a fun bright background Joan B!